These are the words of a Nepalese journalist – Ramesh Prasad Bhushal – writing about his recent participation in the UN climate change conference in Durban as a fellow of the Climate Change Media Partnership (CCMP) programme. Ramesh's attendance at the conference was supported by Growing Forest Partnerships (GFP). This World Bank funded project, which is jointly coordinated by IIED, FAO and IUCN, works to ensure that global discussions about forests take into account the challenges that face forest-dependent people and local forest managers. Over the past six months, Ramesh – alongside journalists from Ghana, Guatemala and Liberia – has been reporting on local forest issues in his own country. This has been done under an 'in-country journalist' project that GFP launched in 2011. One of GFP's overarching aims is to amplify the voices of local communities, small-holders and indigenous peoples. Which is easier said than done. One way to do this is to develop partnerships and alliances that allow local communities to take an active role in discussions and decision-making. Another is to make sure that the issues that forest-dependent people face are told in an accessible and interesting way and shared as widely as possible. A recent blog post by IIED's Nicole Kenton made the point that to "engage the public and have an impact on those who are involved in policy decisions, we need real stories, told by people in their own words." However, for many of us trying to communicate (and support communication) at an international level, these real stories are often too distant for us to tell properly. On the other hand, many local reporters who focus on forestry-related issues face difficulties getting their stories published – or read. Ramesh points out that editors in his country rarely support reporting on the environment as they consider it a low-priority topic. And it's not just about getting local stories out. It's also about bringing news back to communities on the ground who cannot attend such high-level events as the UN climate change talks, but who are directly affected by the decisions made there. Journalists like Ramesh are key to this process. 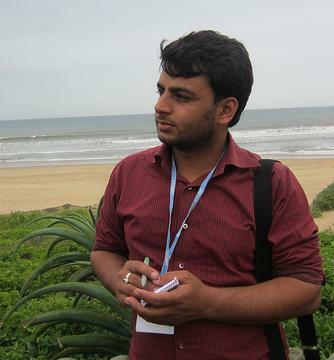 Thanks to the CCMP fellowship, Ramesh was able to report from Durban for his newspaper in Nepal – The Himalayan Times. As well as covering the intergovernmental negotiations he reported on protests that took place on the fringes of the official talks. On a subject closer to the heart of Growing Forest Partnerships, was his article about the concerns of community forest users who remained marginalized in Durban because of internal friction between ministries in their own government: see No place at the climate table, Nepali communities say. So, when those with access to the communication channels are too far away to hear or report from the ground and those that are on the ground don't have access to the spaces where decisions are discussed and taken, it seems clear that an in-country journalist network can be a mutually beneficial bridge over the oft-mentioned gap between 'the local' and 'the global'. "For any environment journalist in a dilemma about whether to continue their profession, this kind of meeting can inspire optimism. Amid the swirling politics, we can see the world coming together to discuss how forests, water and climate are all important for our future. These are the stories we must keep telling." • Create opportunities for journalists to build networks and develop better climate reporting through CoP reporting. Growing Forest Partnerships (GFP) is about building up and supporting networks at local, national and international levels. Through this process, GFP seeks to improve the connections between forests and other sectors. It aims to ensure that global discussions about forests include the real and current challenges that forest-dependent people and local forest managers are facing, bringing the voices of local communities and indigenous peoples forward to influence decision-making. GFP is currently active in Ghana, Guatemala, Liberia, Mozambique and Nepal as well as at an international level where it works to support investment in locally controlled forestry.